Recover Microsoft Office documents, Adobe PDF files and OpenOffice ODS and ODT files from healthy, formatted, corrupted and inaccessible storage media. 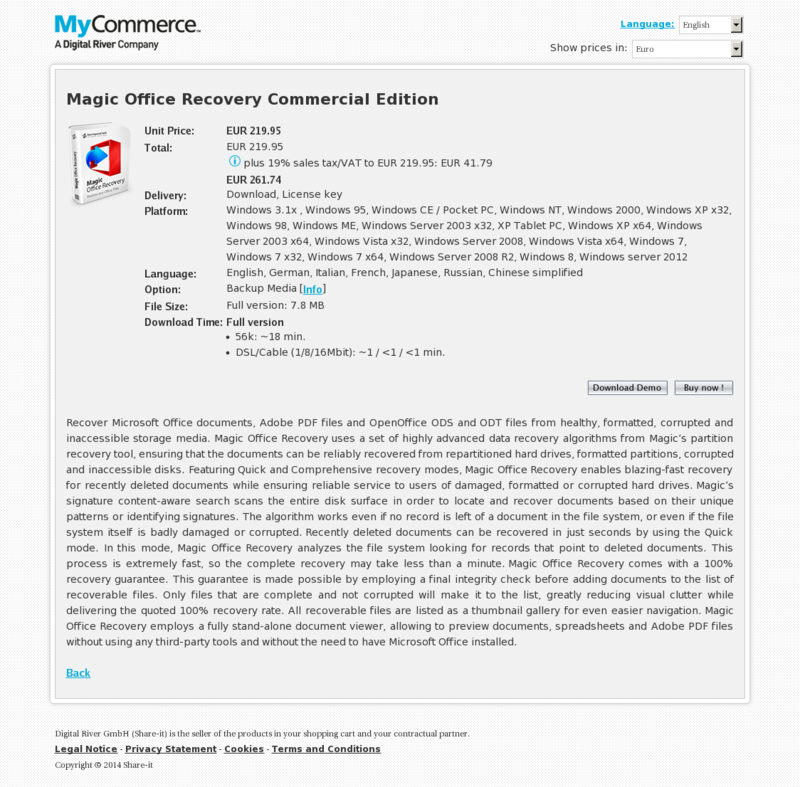 Magic Office Recovery uses a set of highly advanced data recovery algorithms from Magic’s partition recovery tool, ensuring that the documents can be reliably recovered from repartitioned hard drives, formatted partitions, corrupted and inaccessible disks. Featuring Quick and Comprehensive recovery modes, Magic Office Recovery enables blazing-fast recovery for recently deleted documents while ensuring reliable service to users of damaged, formatted or corrupted hard drives. Magic’s signature content-aware search scans the entire disk surface in order to locate and recover documents based on their unique patterns or identifying signatures. The algorithm works even if no record is left of a document in the file system, or even if the file system itself is badly damaged or corrupted. Recently deleted documents can be recovered in just seconds by using the Quick mode. In this mode, Magic Office Recovery analyzes the file system looking for records that point to deleted documents. This process is extremely fast, so the complete recovery may take less than a minute. Magic Office Recovery comes with a 100% recovery guarantee. This guarantee is made possible by employing a final integrity check before adding documents to the list of recoverable files. Only files that are complete and not corrupted will make it to the list, greatly reducing visual clutter while delivering the quoted 100% recovery rate. All recoverable files are listed as a thumbnail gallery for even easier navigation. Magic Office Recovery employs a fully stand-alone document viewer, allowing to preview documents, spreadsheets and Adobe PDF files without using any third-party tools and without the need to have Microsoft Office installed.